Anyway board No.1 is sort of moving along under its own momentum, so back to board No.2 and get the trackwork sorted. I've been cleaning the soldered elements of trackwork using a copper brush mounted in a mini-drill. This was suggested to me by Bob Jones at a recent NEAG meeting, and it has really helped clean the track and reduce the excess solder thereon. At the same time I've been preparing the Tortoise Point Motors for fitting. 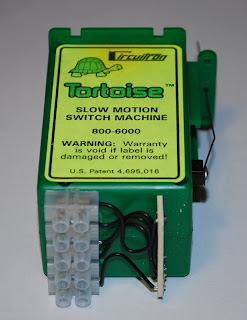 Suitable holes were drilled in the baseboard so that the actuating wire could reach the switch. Several unsuitable holes were also drilled, but I'll refrain from telling you too much about those! By having a couple of spares available, any failure can quickly be remedied without a soldering iron. That's the plan anyway!